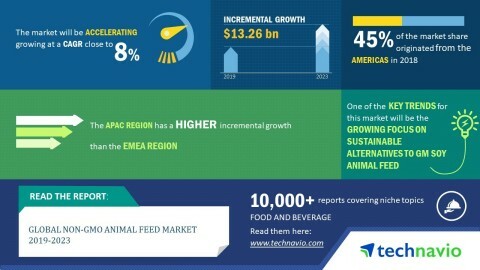 LONDON--(Business Wire)--The global non-GMO animal feed market is expected to post a CAGR of close to 8% during the period 2019-2023, according to the latest market research report by Technavio. A key factor driving the growth of the market is increasing demand for non-GMO products. The demand for non-GMO products has been rising as they are healthier alternatives to GM foods. Vendors are capitalizing on consumers who are ready to pay higher prices for these products to earn higher profits. Sometimes, the profit margin on non-GMO foods ranges between 40% and 50%. It is estimated that the sales of organic and non-GMO food products are expected to increase by 65% in 2019 from 2014. This market research report on the global non-GMO animal feed market 2019-2023 also provides an analysis of the most important trends expected to impact the market outlook during the forecast period. Technavio classifies an emerging trend as a major factor that has the potential to significantly impact the market and contribute to its growth or decline. The demand from animal farmers for non-GMO soy feed is increasing. As consumers are becoming more aware of the perceived harmful effects of GM animal produce, farmers demand non-GMO animal feed with proper labeling to identify the same. Many retail chains offer their own brands of animal produce, claiming them to be obtained from animals that are fed non-GMO feed. For example, Marks and Spencer sources milk from non-GMO-fed cows. Moreover, the market has also been witnessing a drastic increase in the availability of domestically-produced organic animal feed ingredients. Alternatives of soy grains are widely used by animal farmers as feed. For example, farmers in the UK widely use white lupin which has similar protein content as soy. Therefore, with such initiatives, the market is expected to witness a positive outlook during the forecast period. “Apart from increasing focus on sustainable alternatives, one other key factor driving the growth of the market is the growing investment and focus on expanding production capabilities. To cater to the growing demand for non-GMO animal feed products worldwide, manufacturers are focusing on expanding their production capabilities. They also find many growth opportunities in the global markets due to the growing demand for meat products. The increase in production capacity ensures that they are well-positioned to cater to customer needs across markets, which will boost the overall market growth,” says a senior analyst at Technavio for research on food. This market research report segments the global non-GMO animal feed market by product (poultry, swine, ruminants, aquaculture, others) and geographical regions (APAC, EMEA, and the Americas). The Americas led the market in 2018 with a market share of over 45%, followed by EMEA and APAC respectively. However, during the forecast period, the APAC region is expected to register the highest incremental growth, followed by the EMEA region.